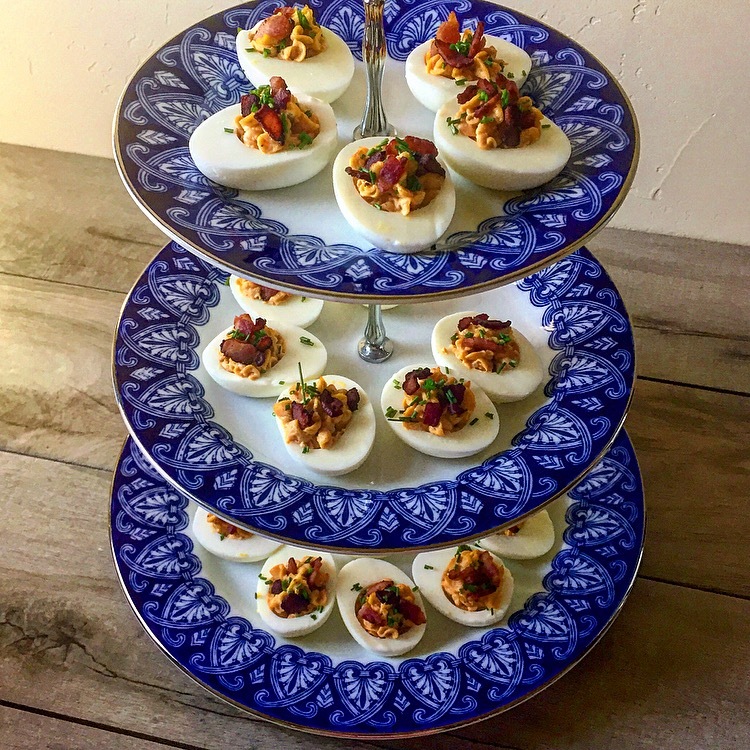 With Easter Sunday just around the corner (in case you don’t realize this it’s tomorrow) I wanted to re-share with you all the updated version of my Perfect Deviled Eggs. 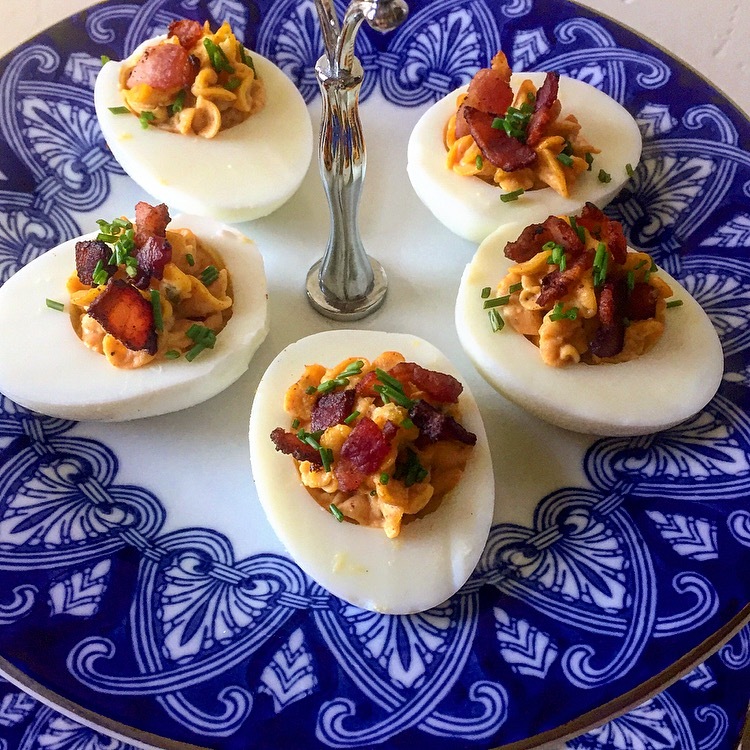 This “Egg-Cellent” recipe was one I originally got from the Green Table Restaurant in NYC about 3 years ago and after a couple of adaptations this had been my Deviled Egg Recipe ever since. These eggs are so perfect in every way they should be renamed “Angel” Eggs. Then again I could also say they are “Devilishly” Good. Either way I promise you will not have a single one left on the plate. Enjoy and have a Happy Easter Sunday!!! 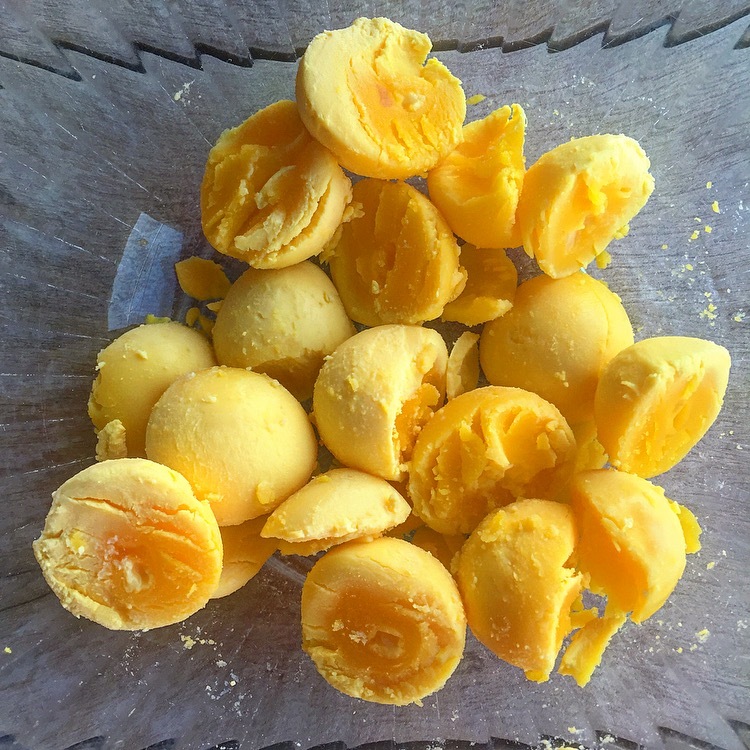 Every one has their own method to cooking hard-boiled eggs and trying to avoid the dreaded “greyish-colored yolk” caused by over cooking. 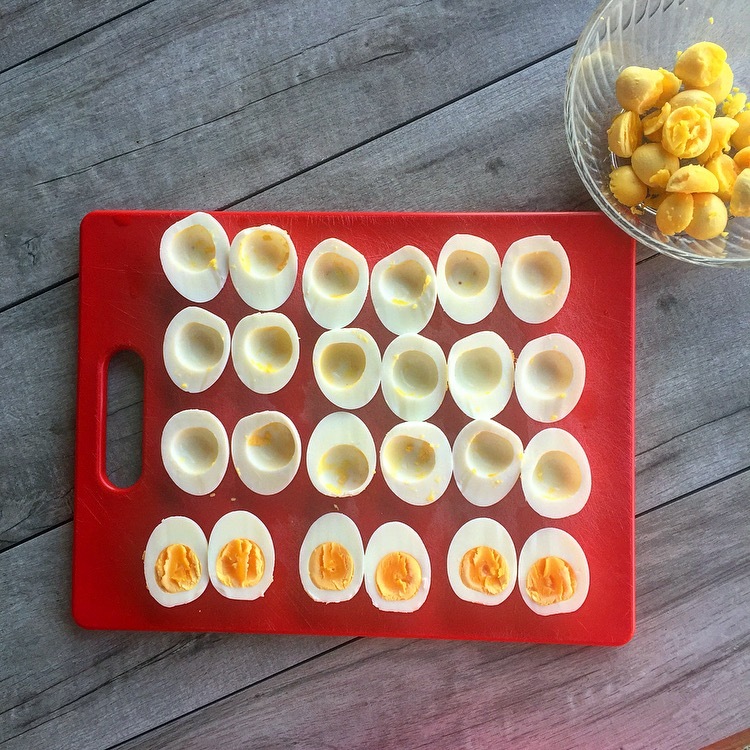 This is how I boil my eggs and keep that bright yellow center. Bring a large pot of salted water to simmer. Carefully lower the eggs (cold from the fridge) into the simmering water with a slotted spoon and give them a gentle stir. Set the timer for 10 minutes. After ten minutes drain off the boiling water and fill the pot with cold water ice water. Leave the eggs in the ice water for 20 minutes. Then gently tap the eggs on the counter and peel the shell off. While the eggs cool cook the diced bacon until crisp then set to the side to cool. Place the egg white halves, cut side up, on a platter. 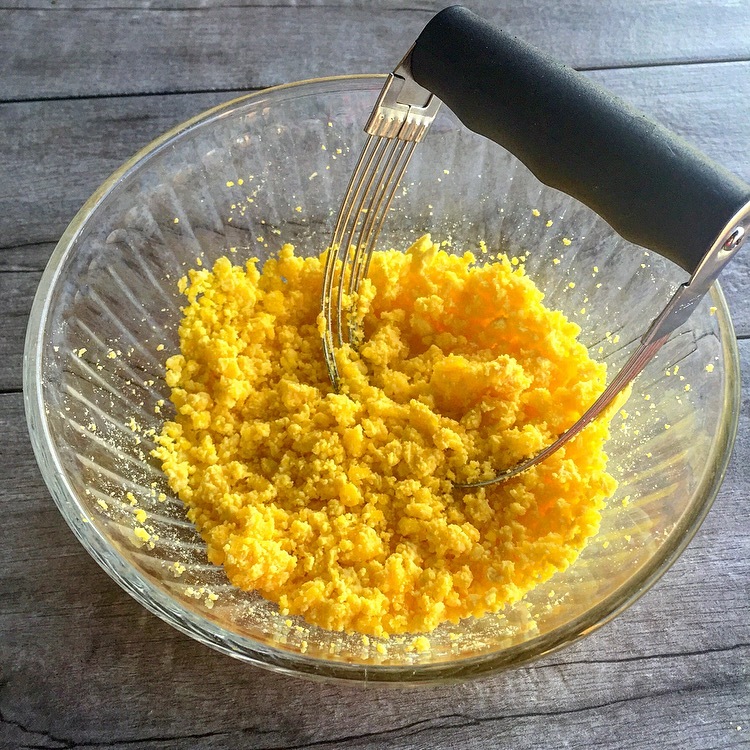 Mash up the egg yolks until very fine. I like to use a pastry cutter for this. 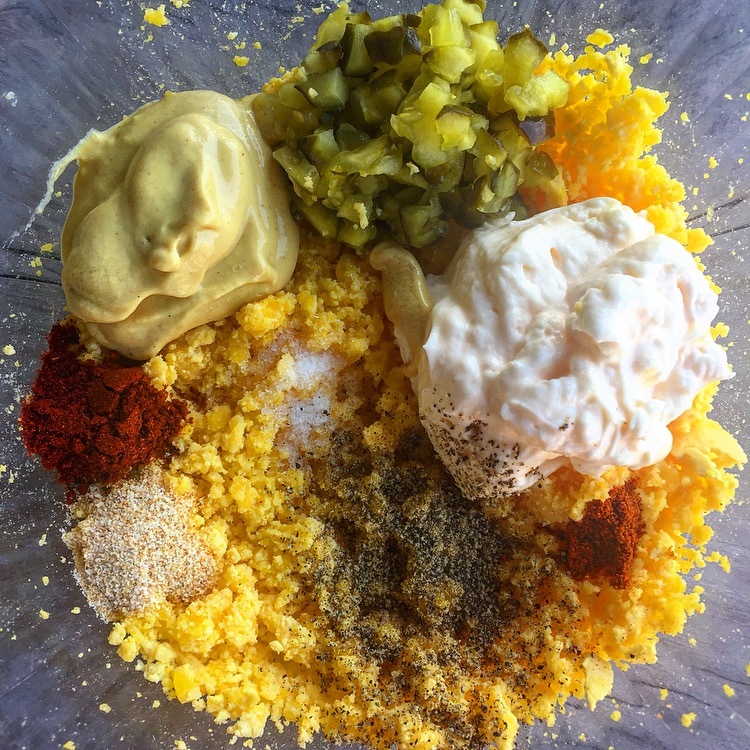 Add the mayonnaise, minced bread and butter pickles, pickle juice, mustard, smoked paprika, garlic powder, cayenne, salt and pepper. Cut a small slit in a zip top bag and fit with a ½ inch large open star tip. Fill the bag with the yolk mixture and pipe the mixture into each of the whites. 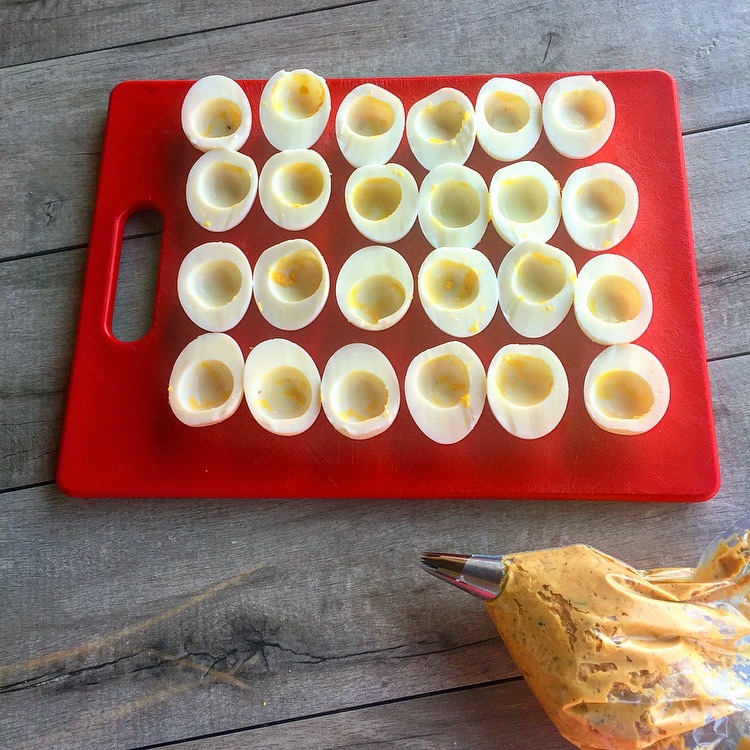 The deviled eggs can be made to this point, covered with plastic wrap and refrigerated for up to 1 day. 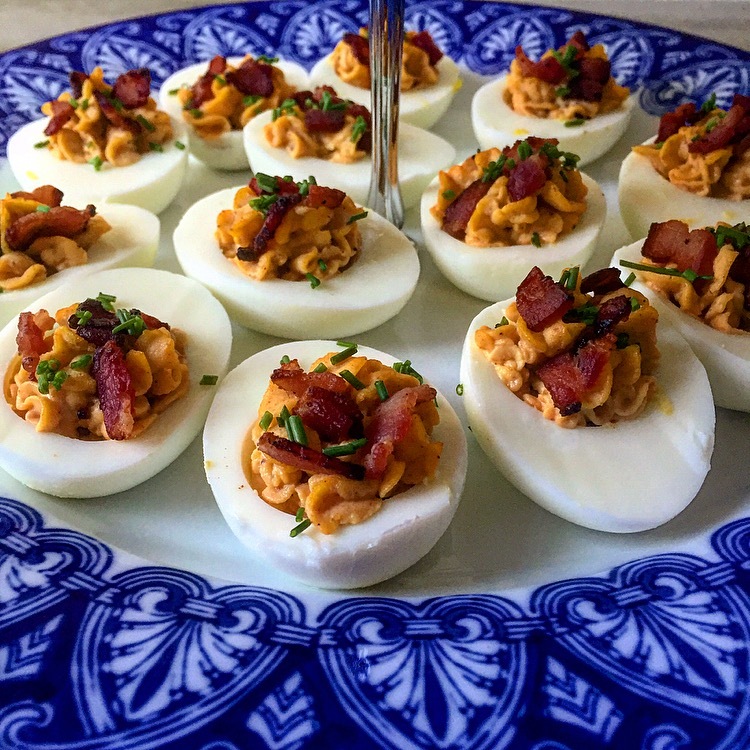 Before serving, sprinkle the deviled eggs with the crisp bacon and minced chives. What a delicious recipe Mel, but what I really like is that GORGEOUS appetizer platter! The platter was my grandmothers it came with matching coffee pot and cups. She was alway the one who hosted Easter Lunch and now it has fallen to me. Thank you, Happy Easter to you and yours too! This was my first year ever to cook Easter Lunch. I had my parents, sister, grandpa, and uncle over and these eggs were one of the things I made. My Grandmother alway cooked Easter Lunch before but since she passed this past December, I volunteered to do it. It was fun but also a little sad. Easter was always one of my favorite holidays to spend at their house. When my sister and I were little my uncle or grandpa would hide eggs for us but they where the hard colored candy eggs with the marshmallow filling. Easter Egg Hunts were always the best!! I know that these next few holidays will be hard on the family. It’s never easy to change traditions after the loss of someone so close.